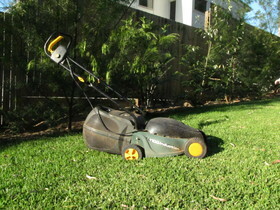 It is with great sadness I have to inform you of the passing of Ozito “Oz” Lawnmower (2006-2011). His tragic demise occurred a couple of months ago in a ball of blue electrical sparks, possibly as a result of exposure to rain… The case for criminal proceedings (negligent homicide) was investigated, but the current punishment of having to use a push mower to maintain the lawns has been concluded to be adequate. I know what my readership wants to hear, so lets talk tech specs! Oz had a 1100W induction motor powered by 230V of electricity at 50Hz. He would cut at a maximum 3000rpm in a counter clockwise direction at the heights of either 31, 47 or 63 mm and with a cutting diameter of 320mm. All this while producing only 96dB of noise. From his birth somewhere in China, Oz had a tough life. His first assignment was a relatively nice piece of lawn, but it came with the risk of a collapsing retaining wall and so he lived in fear of being horribly crushed. Luckily that assignment did not last long, but his second and final one was potentially much worse. Initially the new “lawn” he was sent to mow was nothing much more than a collection of weeds (including some that he just could not handle). This resulted in one of his wheels suffering from a mild detachment issue that required constant attention. Just when his job was looking up due to the clearing and turfing of the entire lawn area, tragedy struck. His wheel came loose and went underneath his blade and was completely destroyed. Much searching was made for a replacement and the end of a drainage pipe was even being considered, when I was told by the helpful man at the hardware store that he had just the thing to fix it… a lawnmower wheel. And so, with the help of a hammer and a piece of wood, Oz got a new wheel attached and was looking forward to working until retirement on a nice patch of grass. Unfortunately, life was not so kind. And so the tale of the life of Ozito comes to its end. He will be sadly missed. This entry was posted in Lawnmower by Allan. Bookmark the permalink. Ohhh, poor Mower… You will be missed, and remembered as the hero fighting the wild grass !